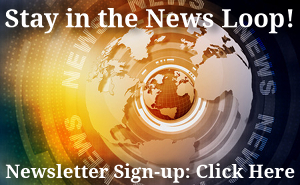 Kernels of Wheat 23 – Will the Real Antichrist(s) Please Stand Up? Show Notes by Jim Kerwin for Kernels of Wheat Podcast Episode 023 – Will the Real Antichrist(s) Please Stand Up? 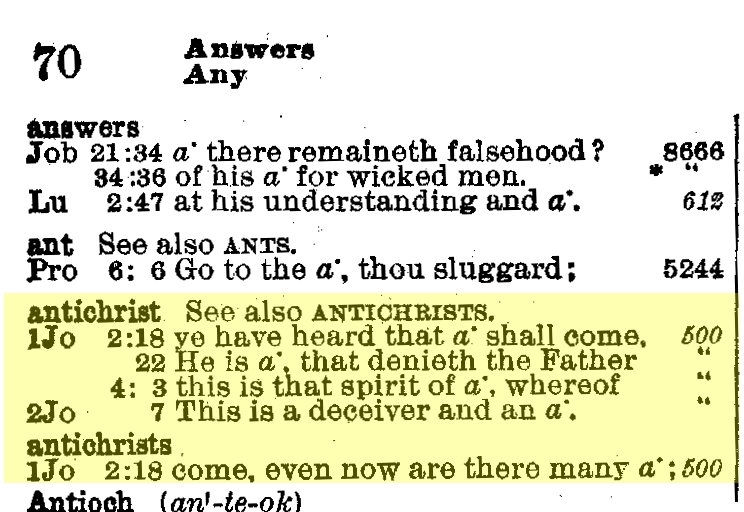 The entry for antichrist in Strong’s Concordance. These five entries–four verses–are the only places where the word ever occurs in the entire Bible. Note the plural in 1 John 2:18. Click on the image for a larger view. Polycarp (A.D. 69-155); bishop of Smyrna; knew the Apostle John and Irenæus. This church father, one who sat under John's teaching, is the last one to say only what the Apostle said about antichrist. Tertullian (c. 160-c.220): equated the “wicked one” of 2 Thessalonians 2:7-8 with antichrist — over 100 years after John's death. Athanasius (c. 293-373) – described the heretic Arius as “Christ’s foe and harbinger of antichrist.” Here is one of the first instances where the antichrist is pinned to an individual. But note that, following Tertullian's lead, Chrysostom is now associating antichrist with a passage outside of 1 John and 2 John. Around A.D. 1000 — a French archbishop labeled Pope John XV as antichrist. Toward the end of the 11th century — Cardinal Benno labeled Pope Gregory VII the same. A.D. 1241 — Pope Gregory IX was called antichrist by Eberhard II, the prince-archbishop of Salzburg. From the 1500s onward, Protestant Reformers held as one of their tenants that the Papacy was the Antichrist. Those who taught this included Martin Luther, Thomas Cranmer, John Calvin, John Knox, and William Tyndale. This view was strongly held in many Protestant quarters through the late 1800s, and even has adherents today. Since the Koran denies that Jesus is the Son of God, Parkyns claimed that Islam could qualify. Will the Real Antichrists Please Stand Up? John is the only one who uses the word, and only in two of his epistles. Although John is the author of the Book of Revelation, he never uses the word in Revelation. It's reasonable to assume that the epistles provide everything we need to figure it out. The antichrists “went out from us” ( 2:19 ) — out from where? 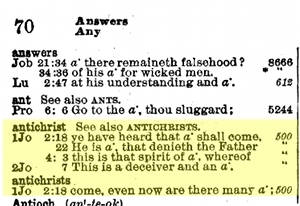 In 1 John 4:3 , the words “spirit” in the phrase “the spiritof the antichrist” do not appear in the Greek text. What keeps us in — or removes us from — that fellowship with God? What constitutes the highest level of maturity? What is mutually exclusive to the love of God in us and our ability to love God? What did we learn about the heresies that John might have been facing? …that the variant of these that will come to light in the next episode about antichrist is more subtle and widespread. What did we learn about “the anointing” and the Anointed One? What did we learn about abiding? This isn't a “game show.” We want to know what the Bible really says about this subject, stripped of all of its historical baggage. Will the real antichrists please stand up? We will look to the Bible “To Tell the Truth” about antichrist in a whole new light in the next episode. Podcast theme music: “Steam Train” from the John Williams album Dusty Porch, under license from Magnatune.com. Graphic was created by the author.